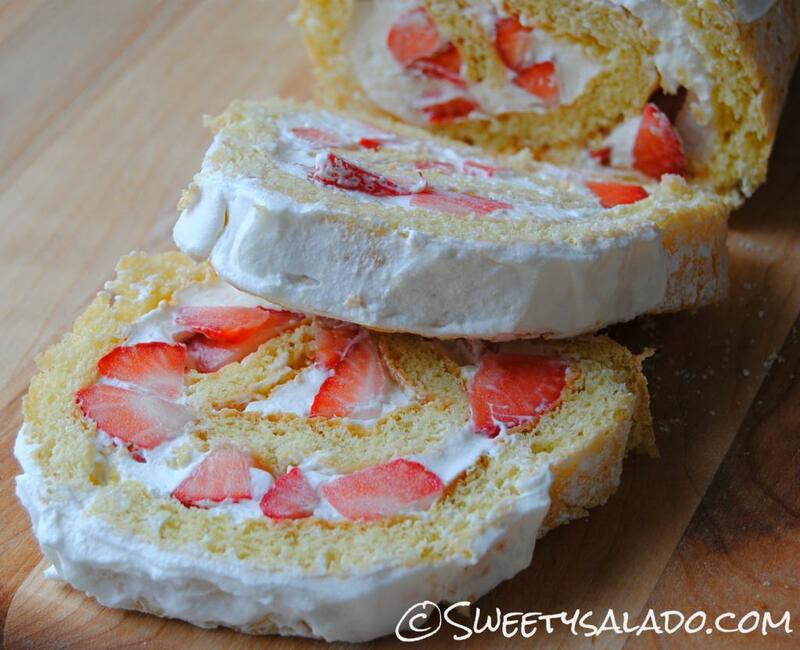 From the moment I decided to start this food blog I always had one recipe in mind to write about and that is the strawberry jelly roll. I remember that it was one of my favorite desserts as a kid and I always ate it with a Premio, which is a Colombian strawberry flavored soda. And of course, as a good Colombian family, eating out was not something we did every day but something that was done on special occasions, so knowing that I was going to eat a strawberry jelly roll was the definition of complete happiness. 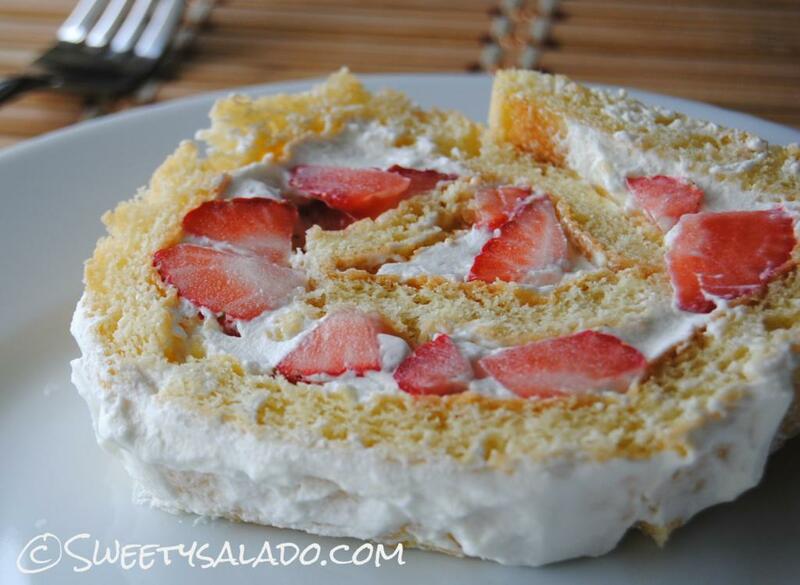 In Colombia this jelly roll is available everywhere and when I was kid it was only made with strawberry filling or infused with strawberry flavor. Nowadays it’s available in all kinds of flavors and colors, with arequipe (dulce de leche), with all kinds of tropical fruits, with jam or jelly, and even with homemade whipped cream, which in Colombian would be called a Swiss roll. Which brings me to the name Colombians give to this dessert, “brazo de reina”, which translates to “queen’s arm”. A queen’s arm? Who ever thought of giving it such a name? Which if you think about it is quite grotesque because eating the arm of a queen is not that appetizing, at least not for me. But anyway, that’s the name given to this wonderful dessert in several Latin American countries such as Chile and Colombia. In Spain they call it “brazo gitano” (gypsy’s arm), so again, we keep the theme of naming it after a human part. In England they call it swiss roll which is not really Swiss since it wasn’t invented there. In the US we call it jelly roll which almost makes sense except when it’s not filled with jelly. But in Japan they call it cake roll, which is the perfect name. If you think about it it’s just that, a cake filled with something sweet, then rolled and cut up in pieces. Genius. I’m going to be honest and tell you that it took a while for me to get this recipe right because making a sponge cake was not the easiest thing for me to make. Pay close attention to the directions, the key is to beat the eggs well and then roll the cake while it’s still warm. 2. Grease a jelly roll pan measuring 12½ x 17½ x 1 inches (32 x 44 x 2.5 cm) with cooking spray. Line the pan with parchment paper and then grease the wax paper again with baking spray. You can also use butter and flour. 3. In a medium bowl, mix the flour and baking powder. Set aside. 4. Beat egg yolks and eggs with ½ cup (100 gr)sugar at high speed for about 10 minutes or until thick and fluffy. Add vanilla extract and milk and mix until well blended. 5. Sift half of the flour mixture into the batter and fold until it is well incorporated. Add the remaining flour and fold in well. 6. Beat egg whites at high speed with remaining sugar and salt until it thickens, about 5 minutes. Fold in the egg whites into the batter. 7. Pour batter into the lined pan and bake for about 15 minutes or until golden brown. 8. Sprinkle a clean kitchen towel with powdered sugar and then flip the cake over it. Remove the parchment paper and then roll the cake along with the towel. Cool completely on a wire rack. 9. Unroll the cooled cake and cover with the homemade whipped cream. 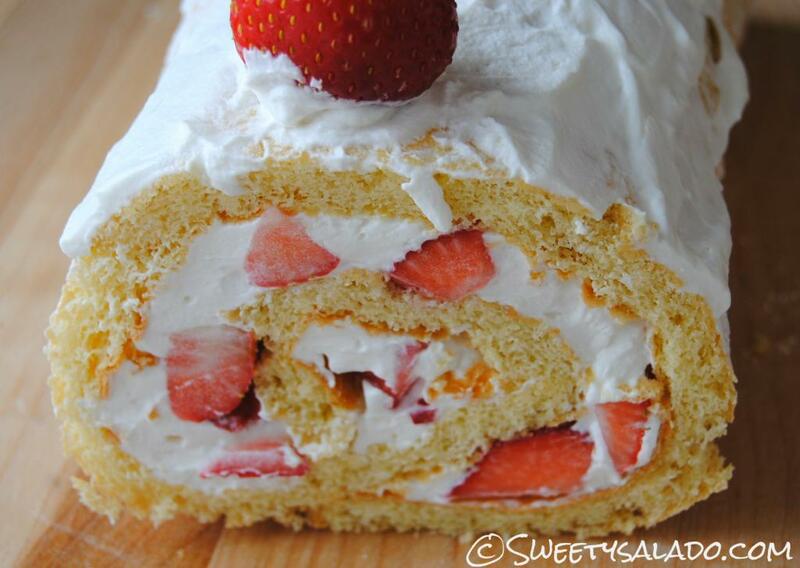 Add the chopped strawberries, roll the cake again and cover the top with more whipped cream if desired. Chill cake in the refrigerator for at least an hour before serving. Hi Carito, you can use almost any cookie sheet you have but it has to be a cookie sheet so that it comes out thin enough to roll. If it's a regular 9×13 pan it will come out too thick and impossible to roll. Hope that makes sense. it does make sense 🙂 thank you so much for your help, I will let you know how it turned out. you are a great cook! Yeah!!! I'm so glad you decided to make it! Thank you so much for your comment and I'm really happy you guys liked it so much. Hugs!